My Impressions: Simon Says Stamp February Card Kit: Yay! It's Your Day (& GIVEAWAY)! Simon Says Stamp February Card Kit: Yay! It's Your Day (& GIVEAWAY)! I'm back with another card to share using the fabulous Simon Says Stamp February Card Kit. 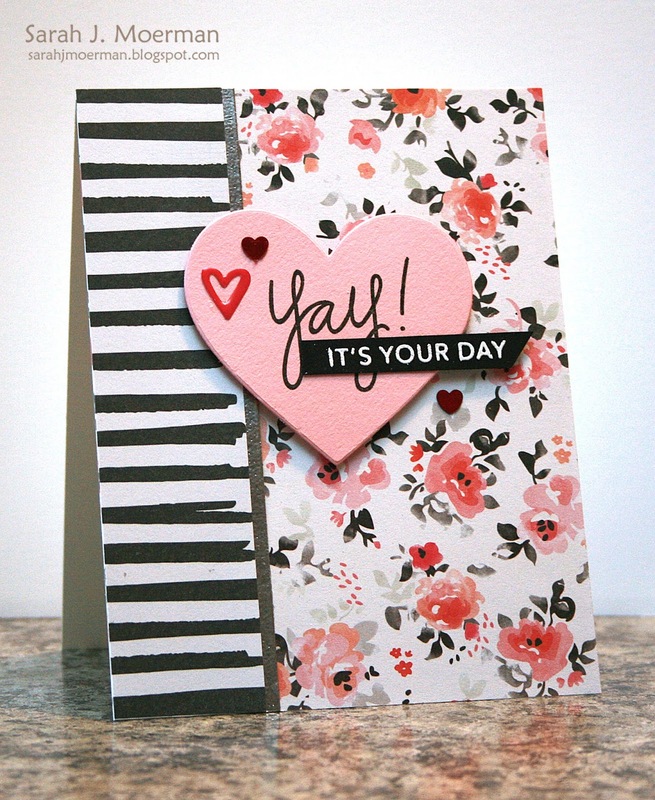 This kit is great for cards for Valentine's, Hello, Congrats, etc. I decided to make a wedding card and wanted to focus on some of the beautiful Crate Paper Hello Love 6x6 Papers. The floral paper I used is absolutely GORGEOUS! I decided to pair it with the more bold/modern stripes. I silver heat embossed a strip of cardstock to place between the patterns. The heart was die cut from Simon's Cotton Candy Cardstock using one of Simon's Nested Hearts Dies. The sentiment was stamped using Simon's Hello Beautiful Stamp Set and the heart was adhered to the card with Foam Tape. The rest of the sentiment was white heat embossed on Simon's Black Cardstock Finally, I embellished the card with a heart from the Crate Paper Hello Love Epoxy Stickers and a couple of Crate Paper Hello Love Sequins. What a great way to use a valentine kit! Your wedding card is gorgeous. Love the papers you used. Thanks for sharing. These sets are always so tempting! this one is great! LOVE these papers together, Sarah! Great card! Gorgeous design!!! LOVIN' this new Simon kit!! So pretty! I love how bold yet feminine this is!! Love this. Beautiful floral paper! LOVE how you combined the floral print with the stripes...I tend to not be great at combining elements like that...but you did it so elegantly! I love the black with the floral. This is a gorgeous card, Sarah! Love the pink and black florals!! Awesome!! I really like this one, very pretty. Sarah I just love your style. Your cards are always simple but so beautiful. Love the colors of this one and that gorgeous floral paper. I am always such a fan of your cards and this one is no exception! Sooooo pretty! Love the graphic black design with the florals, beautiful!! Gorgeous card! And what looks to be an amazing kit! So beautiful! Love the layout! So pretty, love that floral paper, makes the card. you did it again! beautiful! Love the pairing of the pretty floral paper with the fun stripes! Very elegant and modern card. Love how you combined the feminine florals with the bold stripes. This is a beautiful card, I love all your design elements! Great job!! This kit is gorgeous and love how you used the papers. Love the stamp set too, bet this kit is super popular!! Fabulous card .... great card kit! What a nice card and a nice kit. Beautiful card! I love SImonSayStamps card kits! Love this card! The black & white stripes paired with the floral is genius. What a beautiful card!! Love it! So Pretty, Sarah! And I love that SSS heart die cut too! Thanks, Paulette S.
You did a wonderful job with the papers. I love to see how others use DP together. 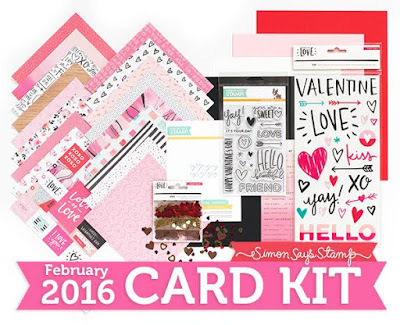 This new card kit is perfect for valentine's! This card is stunning. Love those papers together. Great kit as ever! Beautiful kit! Love what you've made with it! Awesome card! The patterned papers are lovely. These card kits never disappoint! Love how you created the background! Love the simple yet gorgeous deign of your card. I have no clue how to pair patterned paper. You did a really good job! Wow! Your card looks stunning! Beautiful card and card kit! I simply adore your wonderful card! This new kit looks awesome! I love how you paired the different patterned paper. Makes for a perfect card! That black and white striped paper is perfect on this card. Gorgeous card. I love your card so much - I want to CASE it! So pretty - love the your design! Such gorgeous paper too! I'm excited about winning the card kit! Oh what a gorgeous card Sarah. That floral paper is so pretty! Really want those heart dies now too!